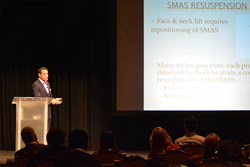 Dr. Kevin Sadati of the Gallery of Cosmetic Surgery recently presented "High Definition Facelift Using Local Anesthesia and Twilight Sedation - A Review of 3000 Cases" at the Aesthetics Show in Las Vegas, Nevada. The Aesthetics Show, held annually in July, is a multidisciplinary medical education meeting centered on the field of aesthetic medicine and the many advances in it. At the Aesthetics Show, participants learn about new procedures, products, and technologies from a group of the top physicians in the aesthetic industry, including Dr. Sadati. Dr. Sadati presented "High Definition Facelift Using Local Anesthesia and Twilight Sedation - A Review of 3000 Cases" at the Aesthetics Show. This unique presentation focused on Dr. Sadati’s specially developed Double-C Plication technique. As an expert in facial and plastic reconstructive surgery, Dr. Sadati developed this natural facelift technique in response to patients’ requests to look naturally younger. He found that the traditional facelift technique, an invasive surgical procedure, often left patients looking “tight” and no longer “natural,” looking as if they had undergone a cosmetic procedure. In addition, it requires the use of general anesthesia and has a longer recovery period. The Double-C Plication is considered a quick procedure, taking approximately two hours to complete. Afterward, there is minimal downtime for the patient and a quick recovery period, with most patients returning to their normal activities within seven to ten days. Aside from Dr. Sadati’s expertly crafted procedure, patients enjoy minimal downtime thanks to his use of local anesthesia and twilight sedation over the traditional general anesthesia. Using this technique, Dr. Sadati has performed over 3,000 facelifts. As a result, his patients look more youthful, with the procedure taking 10-15 years off of their face, and up to 20-30 years off the neck. His patients have reported that they feel and “look amazing,” with no one being able to guess that they had undergone cosmetic surgery. Dr. Sadati is board certified by the American Osteopathic Boards of Otolaryngology-Head and Neck Surgery and is a Diplomate of the American Board of Cosmetic Surgery. He has earned a reputation among his peers and patients for his natural-looking results. As a painter and sculptor, Dr. Sadati has a natural talent for blending art and medical science to produce beautiful results for his patients. For more information on Dr. Sadati and his natural facelift procedure, visit http://www.galleryofcosmeticsurgery.com/.